A look back at the first game highlights against the Knicks. Everything was a go. There may have been a missed game here or there to begin the season, but everything was set for Russell Westbrook to return from his torn meniscus. According to anyone from the Thunder organization who dared to speak, Westbrook was on schedule with his rehab and was starting to mix in some practice time with the team. But then the news dropped on October 1st, that Westbrook would be needing arthroscopic knee surgery and would be out another 8-10 weeks (a.k.a. the first 4-6 weeks of the season). He had recently been suffering swelling in the knee and the team decided to find the source of the inflammation. It turns out that the meniscus had healed properly, but one of the stitches that was holding the meniscus in place had gotten loose and was bothering the joint to the point of inflammation. If that is truly the case, then that is a bit of good news shrouded in the midst of bad news. 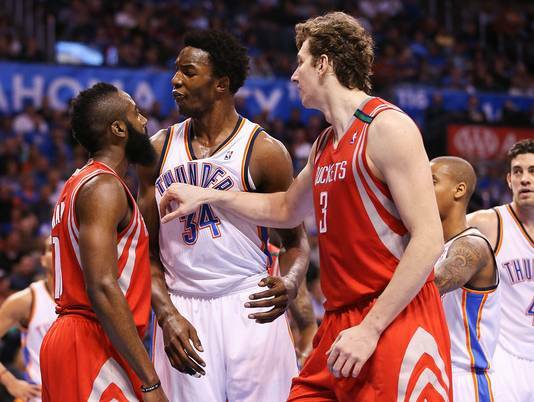 As the saying goes, “when life gives you lemons, attack Patrick Beverly.” What? That’s NOT how the saying goes? Oh, okay. Oh, yeah, I remember now. When life gives you lemons, make some lemonade. 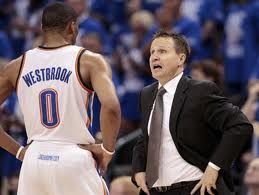 Would you rather have Westbrook in uniform or on the bench in street clothes? Of course you’d want him on the floor. But considering the circumstances, this may be a blessing in disguise. Here are a few ways, as hard as it may be to imagine them now, that this latest setback could be beneficial for the Thunder come playoff time. 1. It’s October, not April. From all accounts, Westbrook’s meniscus healed properly and he was on schedule to return before the inflammation occurred. But, there was still the possibility that he would miss some time in the beginning of the season. It’s better that this occurred now, and not in the middle of the season. I would rather the team treat the first half of the season as an extended training camp (assimilating Russell, acclimating the rookies and the young guys, and setting up a consistent rotation) than to have a hiccup happen in February that completely throws the chemistry of the team off heading into the playoffs. 2. 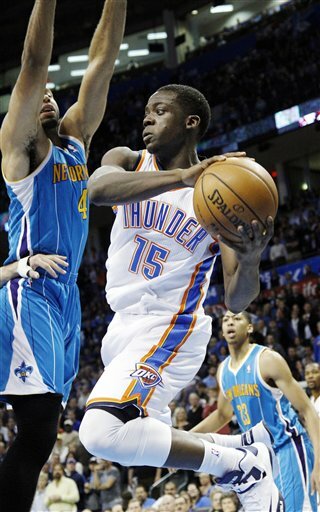 More starting and crunch-time experience for Reggie Jackson. Jackson showed last season what he is capable of. When Westbrook went out with his initial injury in the playoffs, Jackson plugged into the starting lineup almost seamlessly. If he was learning on the fly, he was, indeed, an apt student. In the 9 games that he started in the playoffs, Jackson posted per game averages of 15.3 points, 3.7 assists, 5.3 rebounds, and only 2 turnovers on 47.2% FG shooting and 89.7% FT shooting. And most of it was done against the Memphis Grizzlies, the best defensive team in the league. This past season, the Oklahoma City Thunder completed their 5th season in the state of Oklahoma. In a world dominated by round numbers, getting to the midway point is always a cause for celebration. In any relationship, you look back at key moments that made it possible to arrive at certain anniversary marks. In the next few weeks heading into training camp, I’ll be looking at 5 defining moments that made it possible for the Thunder to not only roar into the Plains, but also to do it in winning fashion. For the third part in this series, I wanted to focus on the rivalries. Sports are only as good as the competition they incite. Playing driveway basketball against your kids when they are 5 years of age can quickly get boring (although palming misdirected shots in midair like you’re Serge Ibaka can be entertaining for at least an hour or so). But, try playing your kids when they are 18 years old and have had 12 years of playing experience. Then it becomes an entirely different ballgame. When it comes to competition, I’ve always looked at the career of Floyd Mayweather Jr. with a sliver of disappointment. That he’s a great boxer with arguably the best defense in the history of boxing is without question. The issue that I’ve had with his career has been the level of competition of his opponents. 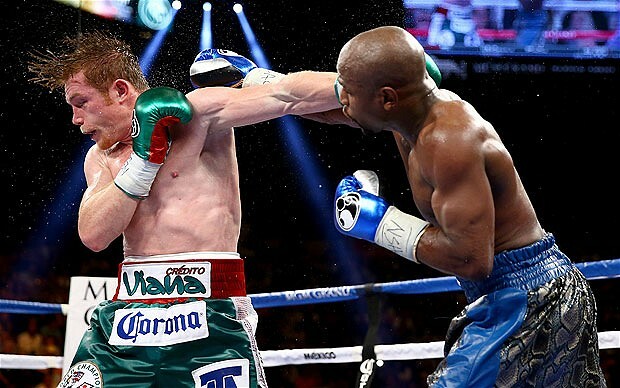 Now, I’m not saying that falls squarely on Mayweather. The guys in his weight classes have not been particularly consistent in the past decade. He’s also “luckily” scheduled the right fights at the right times, choosing to fight boxers that were either on the downward slide of their career (Oscar De La Hoya and Shane Mosley) or fighters that were too inexperienced to compete with him at the time of their fight (Canelo Alvarez and Victor Ortiz). He’s never had that one opponent that defined him. Mike Tyson had Evander Holyfield. Arturo Gatti had Mickey Ward. Mayweather has…… (and therein lies the problem with his career). If fans are the life blood of sports, then rivalries are the engines that keep them running. You naturally root against your opponent because they are competing against you and you want to win. Pretty simple concept. But if you add something more to that competitive fire, it can act like an accelerant, creating an even bigger blaze. Rivalries, and the differing reasons for them, can be that spark. When it comes to the Thunder, I’ve categorized their rivals under 4 different categories. There’s something to be said about big brothers. I never had one growing up, and, honestly, most of the people I associated with while growing up were the oldest children in their families. But in the examples that I did see while growing up, big brothers can help shape and mold younger brothers into something better than what they themselves are. As we’ve seen with the Big Brothers Big Sisters of America, big brothers don’t even have to be related to their younger brethren to have an impact. Big brothers serve two purposes in life: to frustrate and to motivate. The frustration part comes from the big brother’s ability to dominate over the little brother due to being older, bigger, and wiser. The motivation part comes from the little brother wanting to be better than the big brother. The thing about this big brother/little brother dynamic is that the little brother is able to take notes on how to best his big brother, while the big brother just has to wing being a big brother. In a lot of ways, with all due respect to Kendrick Perkins, Nazr Mohammed, Royal Ivey, Kevin Ollie, and Desmond Mason, the best example of a big brother to the Oklahoma City Thunder has been Los Angeles Lakers guard Kobe Bryant. 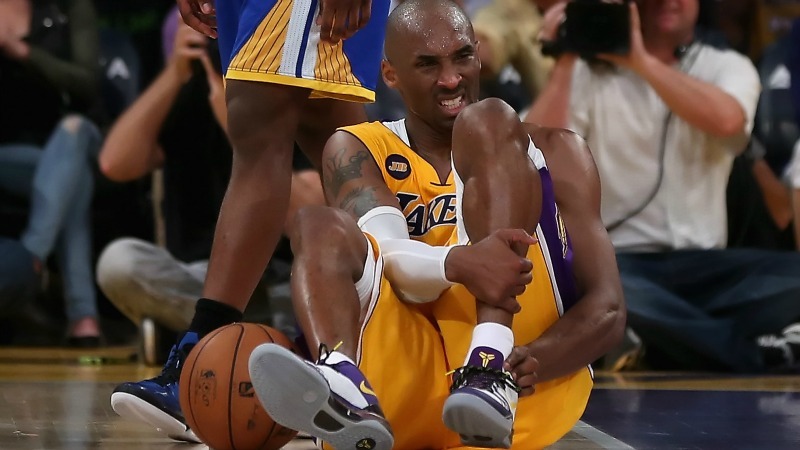 With his recent season-ending (and hopefully, not career ending) Achilles tendon tear, I was forced to evaluate Bryant’s legacy when it comes to the Thunder. If there is one word to describe my feelings towards Bryant’s basketball ability, it’s respect. Off the court, though, Bryant is one of those people that I would try to avoid like the plague. His arrogance and A-type personality, combined with a penchant to place blame on others when things don’t go his way, would be a package that I would completely avoid, if possible, in real life. But on the court, those personality traits, and the fact that he plays for the most polarizing franchise in NBA history, make for must see TV. Bryant is a five tool player that has a lethal 6th tool: the overwhelming need to completely decimate his opponent night in and night out, year after year. Michael Jordan had this 6th tool. Larry Bird had this 6th tool. Bill Russell had this 6th tool. Russell Westbrook HAS this 6th tool. Every successful up and coming team has that one hurdle they set their sights on. If you’re a team that is coming out of the dredges of the draft lottery, you mark successes in increments. First step is to be competitive on a nightly basis. Then the next step is to get into the playoffs. Then the next step is to be successful in the playoffs. You keep going until, hopefully, eventually, you win a championship. But along the way, especially in the early stages of the success journey, you always target that one team that’s been there and done that. For the Chicago Bulls in the late 80’s and early 90’s, it was the Detroit Pistons. For the Orlando Magic in the mid 90’s, it was the New York Knicks. 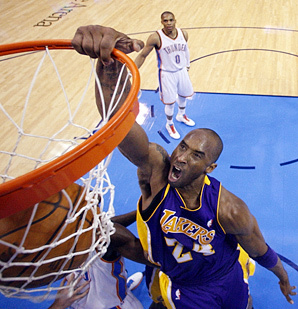 And for the Thunder, it was the defending champion Los Angeles Lakers. As fate would have it, that 2010 playoff series that pitted the No. 1 seeded Lakers vs. the No. 8 seeded Thunder was probably the best thing for the development of the Thunder. The fact that they were able to give the eventual champion Lakers a fight in the first round did wonders for the confidence of the young Thunder. 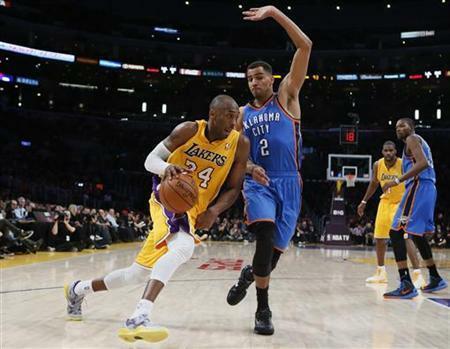 But if you broke it down to its simplest form, the Thunder didn’t give the Lakers a test. They gave Kobe a test. They planted the seed in Kobe’s head that we would be a force to be reckoned with for the foreseeable future. When the crowd would chant, “Beat LA”, they were actually chanting “Beat Kobe”. Nobody feared Pau Gasol. Or Andrew Bynum. Or Derek Fisher (hehe!). We knew that Kobe had received the message. And that was both awesome and fearful (respectful) at the same time. 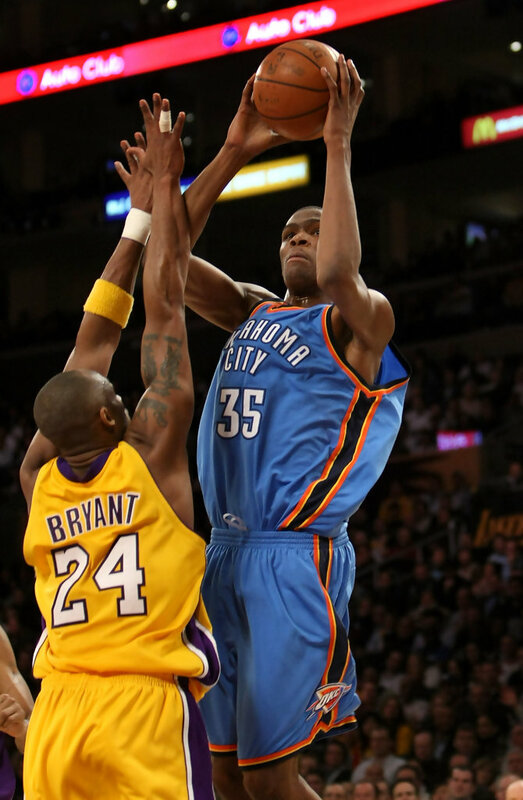 As the Thunder’s two superstars, Kevin Durant and Russell Westbrook, progressed in the NBA world, they would eventually come in contact more often with Kobe Bryant. On Western Conference All-Star teams and, most importantly, the Olympics, Thunder fans can only hope that our superstars soaked up any of the psychological warfare that Bryant uses on a daily bases. Those blurbs that you hear from media members about Bryant talking trash to Durant, Westbrook, and at the time, James Harden during the Olympics, when they heard that the Lakers had acquired Dwight Howard and Steve Nash, is just classic mental warfare from Bryant. It’s the equivalent of how the military drops leaflets into countries they are warring with stating how their government is endangering them, the common citizen. So with that, I say, thank you to Kobe Bean Bryant. 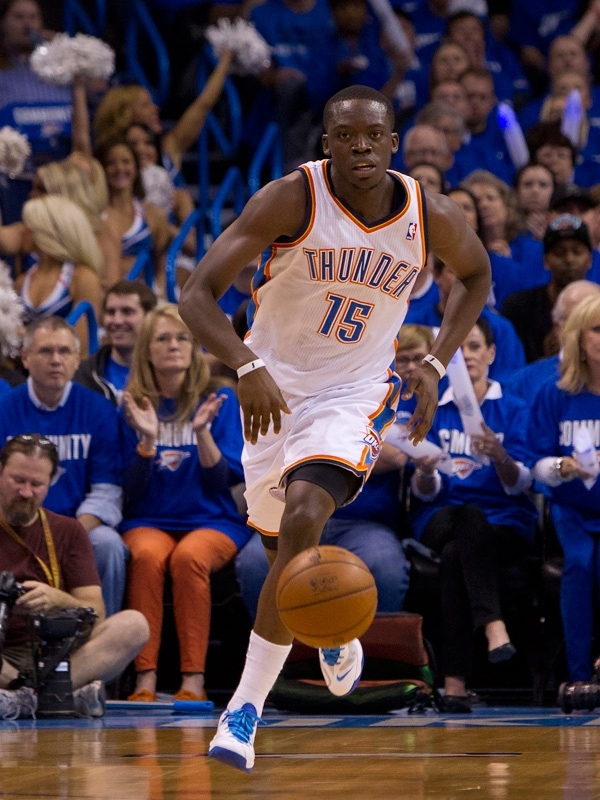 He has as much a stake in the Thunder’s ascension and success as does any of the veterans that played for the team. He was the target that we went after when we wanted to be successful. Much like an older brother, he frustrated us. But he also motivated us. And we learned much from facing him and defeating him. Here’s hoping that Bryant does come back, while, realistically realizing, that the Bryant we knew, may have gone down in a heap in the Staples Center on Friday night. Whatever the future holds for Kobe, just realize that the future of the Oklahoma City Thunder was shaped, in part, by the man in the Lakers uniform that we feared and respected the most. If the goal of the regular season is to get home court advantage throughout the playoffs, then this is probably the most important stretch of the season for the Oklahoma City Thunder. With their win over the Portland Trailblazers and San Antonio’s loss to the Houston Rockets last night, the Thunder find themselves 1.5 games back of the Spurs for first place in the Western Conference. These next two weeks may be the most critical for the Thunder in their quest for home court advantage in the Western Conference playoffs. Any time you’re playing catch-up, you always need a little help from the team that’s ahead of you. Luckily for the Thunder, the Spurs play an incredibly difficult slate of games before their meeting with the Thunder on April 4th. The Spurs next five games look like this: vs. Denver, vs. Los Angeles Clippers, vs. Miami, at Memphis, and vs. Orlando. While 4 of those 5 games are at home, the combined winning percentage of these five teams is .623. San Antonio is very good at home, but this stretch comes at a time when the Spurs play 6 games in 9 nights (to include the Thunder game). With San Antonio’s propensity for resting it’s veterans during these types of stretches, there’s not a lot of wiggle room in the schedule for the Spurs to do that without risking a game or two. The Thunder, on the other hand, play 3 games in 4 nights beginning Wednesday: at home against Washington, and then a double dip on the road on back to back nights against Minnesota and Milwaukee. The combined winning percentage of these three teams is .406. Not exactly the gauntlet that San Antonio has to face during that same time period. After that short road trip, the Thunder get four days off before their game against the Spurs. While the Thunder will be well rested, the Spurs will be playing their 4th game in 5 nights. After the Spurs game, though, the Thunder will hop on a flight to Indianapolis to face the Pacers the next night. The key word in the next 10 days will be focus, sprinkled with a little bit of luck. The Thunder should win their next 3 games easily. 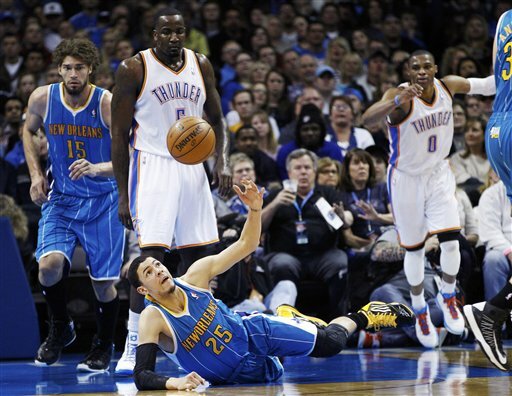 But the Thunder have been known to play down to the level of their competition, especially on the road. Even the game at home against the Wizards will be fraught with caution, as John Wall has completely recovered from the knee injury that caused him to miss the first 33 games of the season. In his last 9 games, Wall is averaging 25 points, 9.3 assists, and 2 steals per game, while leading the Wizards to a 6-3 record over that time against some stiff competition. The Timberwolves always give the Thunder problems, especially in Minnesota, regardless of who is on the active roster. And Milwaukee is chock full of players that can go off for 30+ points at any time (Monta Ellis, Brandon Jennings, JJ Redick, Ersan Ilyasova). All this is before they actually play the Spurs. The Thunder had an opportunity to take over first place from the Spurs two weeks ago, but decided to fall asleep at the wheel in the 2nd quarter of that game and never recovered. 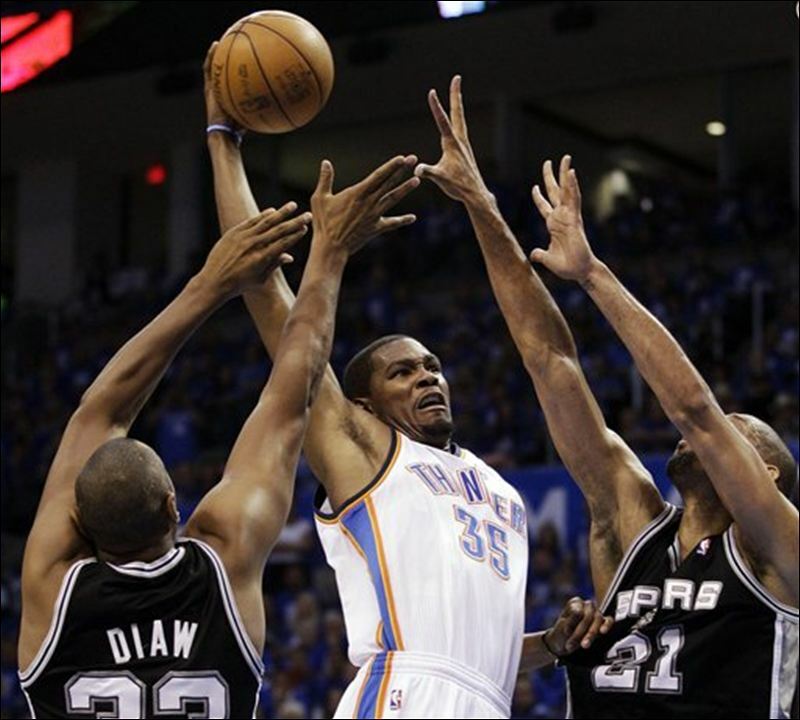 The Spurs are offensively great where the Thunder are defensively weak (dribble penetration and 3-point shooting). The Thunder have the ability to beat the Spurs, as shown in last season’s Western Conference Finals, but usually have to catch a couple jabs to mouth before they wake up. 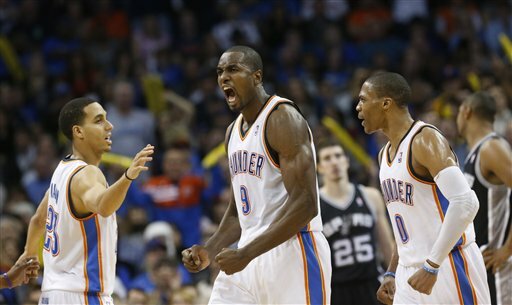 Hopefully, the Thunder comes into this game with a winning streak and the Spurs are coming off a loss or two. The most important game in this whole stretch may be the Indiana game. If the Thunder accomplish their goal and take over first place after the Spurs game, they still have to regroup and come back the next night against one of the toughest teams in the league. This is where their focus comes into play. It would be a shame for the Thunder to gain control of the conference one night, and then give it away because of the lack of focus the next night. Trap games are usually reserved for games before rivalry games, but this may be a case of a post-trap game. The Thunder needs to live by their creed of “one game at a time,” and treat every game with utmost importance for here on out. Do they need San Antonio to possibly lose a game or two? Yes. But that becomes a moot point if the Thunder doesn’t take care of their own business. In a time where it seems like every elite team is streaking and peaking, Oklahoma City has some how managed to tread water long enough to position itself into possibly getting the top spot in the West. Do the Thunder need to win the West to advance to the Finals? They didn’t need it last season when they were the number 2 seed and still beat San Antonio in the Western Conference Finals. But, this is a different team, whose role players seem to respond a lot better at home than on the road. For that reason alone, the Thunder should be making every possible push to get home court advantage throughout the Western Conference playoffs. It’s all about staying focused from here on out. Family dynamics; the things that make families tick. The quirks that are only understood by you and those you consider family. The word family, though, can be used very loosely. Family doesn’t necessarily have to be just people related to you by blood. There can be a family dynamic with the people you work with. The fact is that most of us spend half of our waking moments with the people we work with, if not more. We usually share 1-2 meals a deal with these people we call co-workers. So, quirks definitely develop amongst those that we share an employer with. On a team like the Oklahoma City Thunder, you definitely see the quirks that work with this team. The core of this team (Kevin Durant, Russell Westbrook, Serge Ibaka, Thabo Sefolosha, Kendrick Perkins, Nick Collison, and coach Scott Brooks) has been together for close to 3 full seasons, which is an eternity, in NBA years, for 6 players and one coach to be on the same team for that length of time. Add to the mix Reggie Jackson and, even, Derek Fisher, who has been with the squad for the last two seasons, and you start to bring familiarity and comfort into the fold. On a team like this, teammates can cuss each other during the game, and then go out to dinner after the game with smiles on their faces. It’s the quirks that make it work. 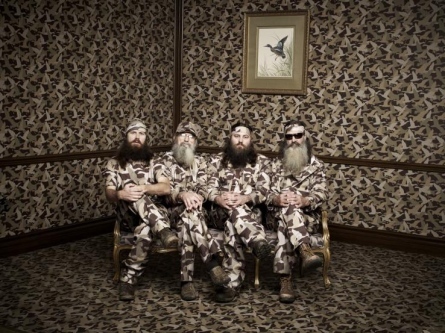 It’s very similar to the characters on what has recently become my current guilty pleasure, Duck Dynasty. The basic premise is a reality show about a family that runs a business. But, the family dynamics are what make the show great. You have three sets of generations all working and interacting as a family, but also as coworkers. Add to that, outsiders (co-workers) that have been indoctrined into the family, and add to the hilarity of it all. In the end, you have a show where the goodness of family values meets the craziness of work site antics that makes it very difficult to turn away. A lot like watching the Oklahoma City Thunder play. 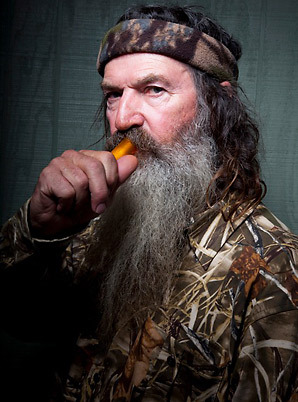 Phil Robertson is Nick Collison – Phil Robertson is the patriarch of the entire family. He’s the one that started the company and made it famous with his Duck Commander videos. Now, mostly retired, he still helps out whenever necessary, but mostly expounds wisdom like an old sage to whoever will listen. Nick Collison is like the patriarch of the Thunder. He’s been on the team longer than any player currently on the roster, and carries years of experience with him. While still a serviceable bench player, he’s known to expound nuggets of wisdom to young players on the nuances of the game. 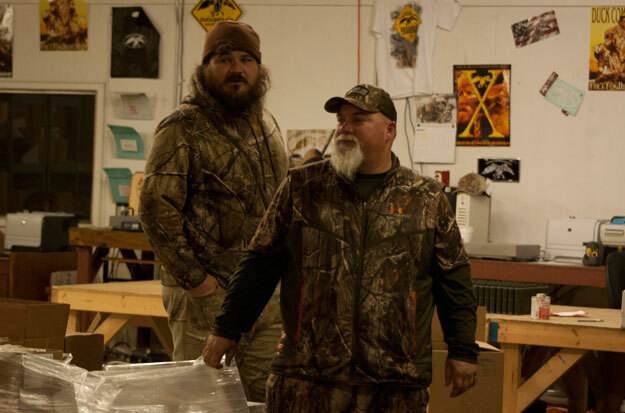 Willie Robertson is Kevin Durant – The main focus of the show is on Willie and his running of the business. He is the brains behind the operation and has used his business acumen to turn it into a multi-million dollar empire. But don’t ask him to get his hand dirty. He would much rather keep the white collar on, than do some manual labor. Much like Willie, KD is the main focus on the Thunder. His ascension into superstardom has coincided with the Thunder’s rise as an elite team. While Durant has no problem getting his hands a bit dirty, he’d much rather do his work calmly and efficiently than to leave a trail of mayhem. Jase Robertson is Russell Westbrook – Jase is the main antagonist to Willie, with the word antagonist being used very loosely. While they are brother, Willie is Jase’s boss, and would like nothing more than if Jase would get to work. Jase, on the other hand, has what I would call a YOLO-type (you only live once) personality. If they is any type of mayhem to get into, Jase is usually the first one in line. If there were three words to describe Westbrook, YOLO, mayhem, and antagonist would be very apropos. 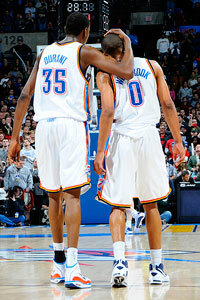 Contrary to what most outsiders think, Westbrook is not Durant’s antagonist. But Westbrook does have a very antagonistic attitude towards the people reporting about him. His unbridled play on the court is equal parts masterpiece and mayhem. 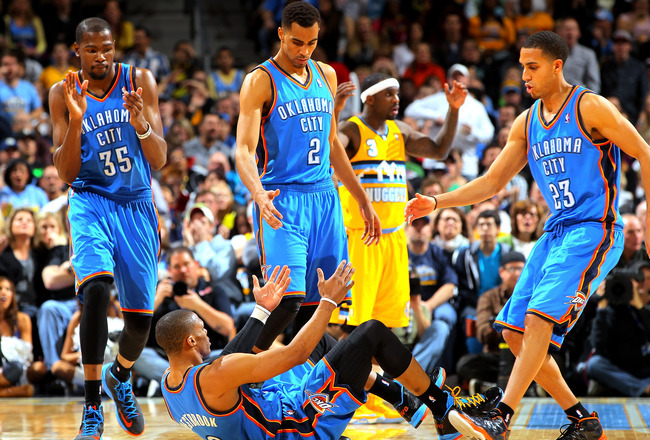 And if there is someone on the team unafraid of the moment, it’s Westbrook (and Durant, of course). Jep Robertson is Kevin Martin – Jep is the youngest of the Robertson men and is the mama’s boy of the bunch. His beard has this weird shine to it that makes him look like a pretty boy compared to his brothers, father, and uncle. He has been kind of quiet for most of the time the show has been on the air, but has recently gotten more exposure in this current season. Martin is kind of the quiet, pretty boy of the team. He’s not known to get his hands dirty, and would rather do most of his damage from the outside. Also, his quiet demeanor makes him almost invisible on the court at times. Martin and Godwin are Serge Ibaka and Hasheem Thabeet – Martin and Godwin are two of the employees that work for Duck Commander, but are not related to the Robertson family. They usually get involved in Jase’s antics and add to the mayhem of the moment. These two bigs boys have no problems getting their hands dirty for whatever is necessary. Ibaka and Thabeet are two of the big boys inside for the Thunder and have no problem getting into a little mayhem themselves, as evidenced by Ibaka’s recent karate chop of Blake Griffin’s baby making factory and Thabeet’s penchant for getting under the skin of opposing big men. Also, the African connection makes this duo very similar to the duo of fat guys who aren’t related to the Robertsons. John Luke Robertson, Reed Robertson, and Cole Robertson are Reggie Jackson, Perry Jones III, and Jeremy Lamb – The younger generation of the Robertson family. They are shown the ropes by the older generation, and while going on their own paths, soak in most of the wisdom that the older generation tries to impart on them. Similarly, the young bucks for the Thunder are trying to carve their own niche on the team, while absorbing any nuggets of wisdom that they can get from the veterans. 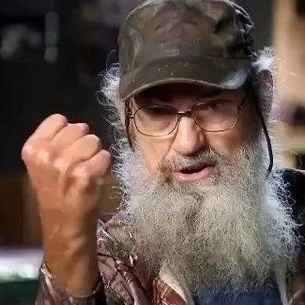 Si Robertson is Kendrick Perkins – Was there any question about this one? Si is, literally, the crazy uncle of the bunch. He’s the old guy that works with the young guys, but fits in just fine because he’s crazier than all of them combined. Si vocabulary is a mixture of pop culture and country bumpkin. The court jester of the show, Si keeps the mood light, but will also get you if he has to. As I’ve written before, Perk is the crazy uncle of the Thunder. His Southern drawl makes his sayings, such as “Get in there gurl!” and “Ball don’t lie” that much more memorable. 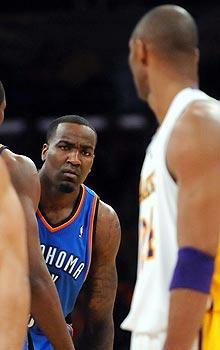 With his trademark scowl, Perkins is able to intimidate opponents, while making the scowl a loveable trait. While he keeps the mood light, he also expects his teammates to do their job and will grill them if they are lacking. Mountain Man is Derek Fisher – Mountain Man is a neighbor that has known the Robertsons for years and occasionally makes appearances on the show. He’s great as a Mr. Fix-it and sometimes adds a nugget of wisdom here or there. Like Mountain Man, Derek Fisher has made occasional appearances for the Thunder the last two seasons as a late season addition to help bolster the bench for the playoff runs. Fisher adds experience to the bench and can still hit a big shot or two. Miss Kay Robertson is Wanda Pratt – Miss Kay is the matriarch of the family. She brings the family together through food and is always there to lend an ear. 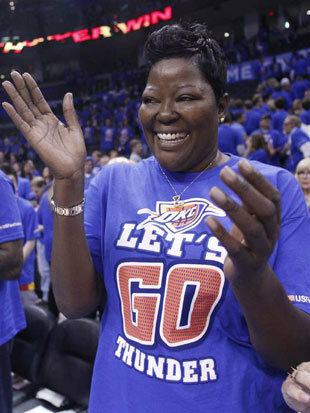 Prior to this season, Wanda Pratt was the Thunder’s unofficial team mom, but has been mostly MIA this season. Hopefully she’ll return for the playoffs. 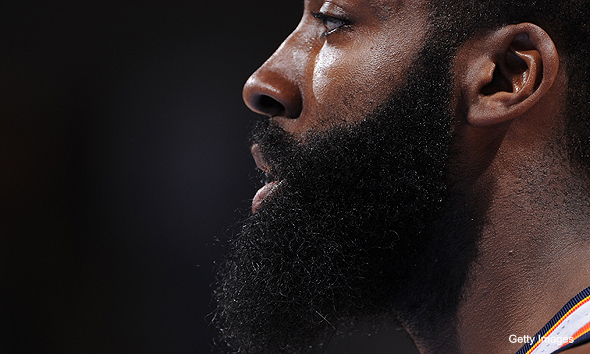 Side notes: I’ve been thinking about doing an article like this since last season, but it would have been too easy with James Harden and his Beard in the fold. At the end of the each of the episodes, the Robertson clan gather together at the dinner table and break bread, as any good family should. Through the good and the bad, they still gather together and share that precious family time. Same thing with the Thunder. Though they may argue with each on the court and off, you can be sure that they will be there for each other and will be “riding together and dying together” come this playoff season. Thunder the Duck Up! It’s getting to that point in the season where mostly every game carries some sort of importance, either for playoff seeding or draft lottery probabilities. The Oklahoma City Thunder are coming off a road loss to the San Antonio Spurs, where they had the opportunity to overtake the Spurs for the top seed in the Western Conference. The Utah Jazz, on the other hand, are on the opposite end of the playoff spectrum. The Jazz held onto the 7th seed in the West as recently as one week ago, but losses in 7 of their last 9 games has the Jazz looking up at the hard charging Los Angeles Lakers for the final playoff spot in the West. With that said, there are heavy playoff implications for both teams in this game. This is the 3rd meeting of the season between these two Northwest division rivals. 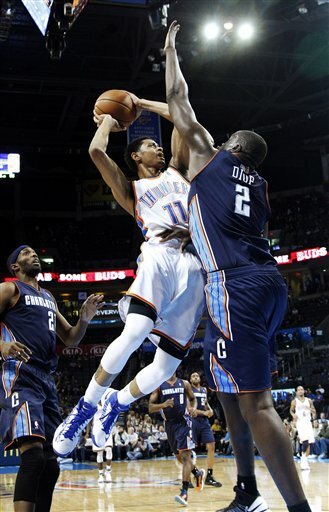 The Thunder easily won the first game at home, 106-94. 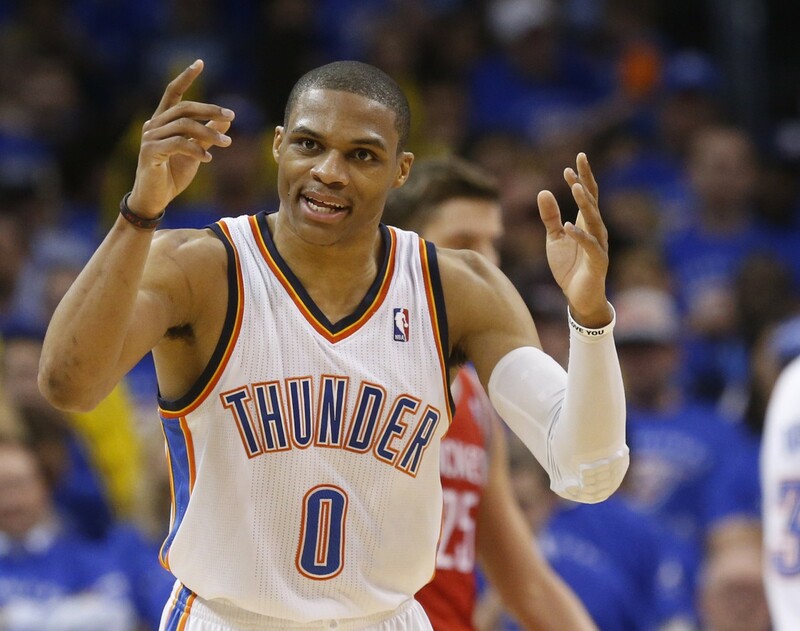 In that game, Russell Westbrook nearly notched a quadruple double with 23 points, 13 rebounds, 8 assists, and 7 steals. 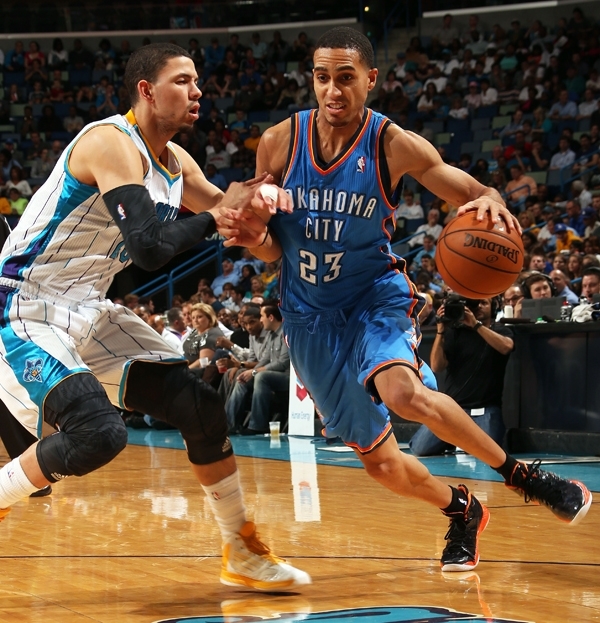 Kevin Durant chipped in with 25 points and Kevin Martin added 19 points off the bench. In the 2nd meeting of the season, the Jazz basically flipped the score while playing in Salt Lake City, 109-94. In that game, the Jazz dominated the paint, with Al Jefferson and Paul Millsap combining for 41 points and 17 rebounds (9 offensive). Post Defense – It can’t be said enough against teams that have two functional big men how important it is to control the paint defensively. In the first game between these two teams, Jefferson and Millsap were held to 29 points on 12-29 FG shooting (41.4%). In the second game, a Thunder loss, the Jazz duo combined for 41 points on 19-36 FG shooting (52.8%). It’s up to Perkins, Ibaka, and Nick Collison to contain these two. Defensive Rebounding – Related to the post defense, defensive rebounding is extremely key when dealing with the Jazz. 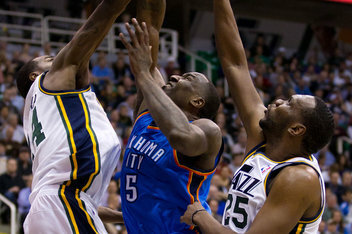 The Jazz grabbed 21 and 16 offensive rebounds, respectively, in the two games against the Thunder. Offensive rebounds lead to extended offensive possessions and more shots for the opposition. The Jazz shot 17 and 19 more shots, respectively, than the Thunder in the two games they played against them. 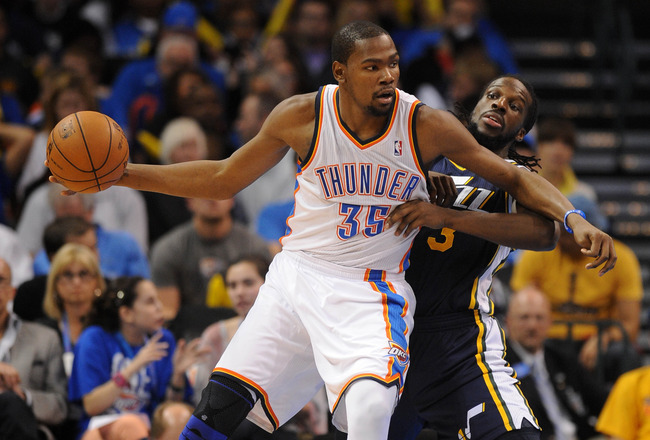 Durant – The Jazz don’t really have any answers for guarding Durant. DeMarre Carroll will attempt to get physical with Durant, but will eventually succumb to foul trouble and Durant’s speed. 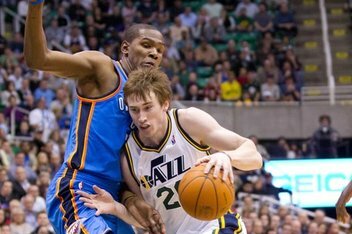 And Durant is usually a horrible match-up for Gordon Hayward. 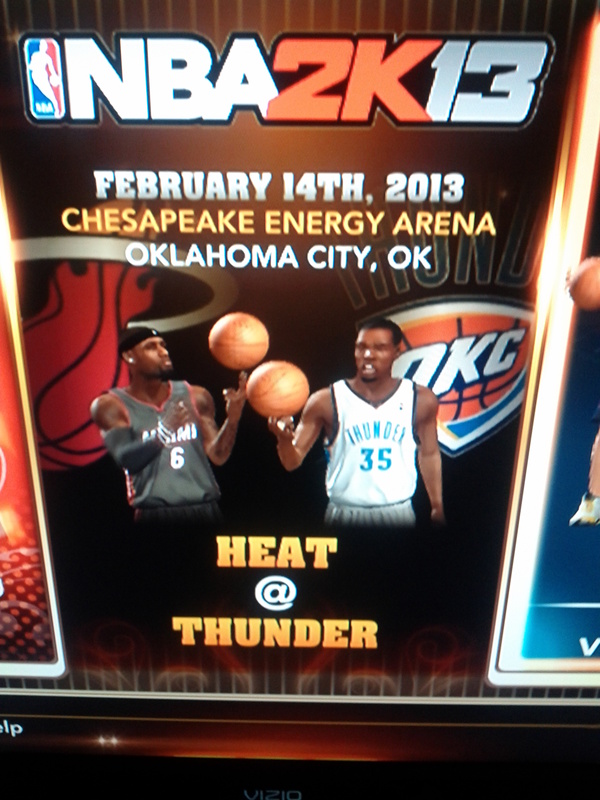 I expect Durant to get at least 30 points in this game. 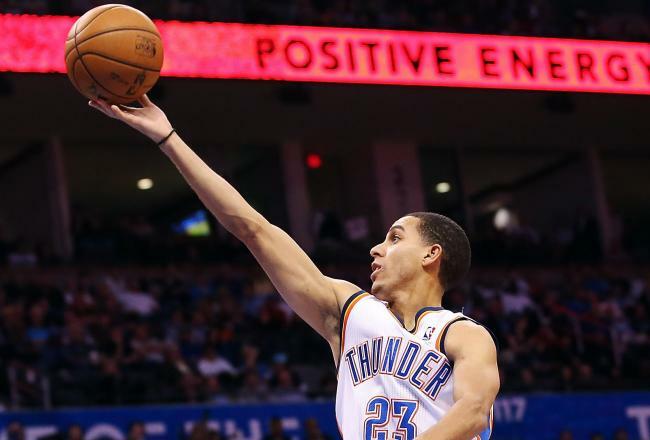 One of the biggest decisions facing the Oklahoma City Thunder this offseason is whether or not to keep Kevin Martin past this season. Martin was the other big name in the blockbuster deal that sent James Harden to the Houston Rockets a couple days before the 2012-13 season began. Martin was brought in to maintain the scoring provided by Harden off the bench and has nearly matched Harden’s bench output from last season when Harden was the NBA’s 6th Man of the Year. Though he has struggled at times this season in his new role, especially in home/road splits, Martin has performed well enough to be an integral part of the Thunder, who are once again, championship contenders. People tend to think of contract negotiations, exclusively, as an offseason event. But the chess pieces that are the “Kevin Martin negotiations” have been shuffling around the chess board all season long. There are always two sides to any negotiation, but there are so many variables that influence the final decision. Those variables are the chess pieces the Thunder and Martin have been playing around with for the entire season. In this article, I’ll look at some of those variables and see how they will influence the upcoming negotiations between these two parties. 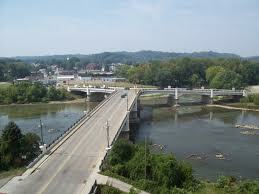 Background – Martin comes from Zanesville, OH, which has a population of about 25,000 people. He has maintained very close ties to that community and is constantly involved in community events (basketball camps, 3-on-3 tournaments, etc.) during the offseason. With that said, it doesn’t seem that big city lights have the same effect on Martin as it does with many other players in the NBA. He started his career in one of the smaller markets in the NBA (Sacramento), and then played in one of the bigger markets in Houston. A community like Oklahoma City probably reminds Martin a lot more of Zanesville than a city like Houston would. Personality – If Russell Westbrook’s personality can be described as hyperactive and intense, then Martin’s can be described as cool, calm, and collective. I don’t think I’ve ever seen a player who touches the ball so much, have so little emotion. It’s not hard to imagine Martin committing a turnover and reacting by saying, “Darn,” in little more than a whisper while jogging to the other end of the floor. And I’m not necessarily saying that’s a bad thing either. On a team full of emotionally charged players (Westbrook, Kevin Durant, Kendrick Perkins, Serge Ibaka), it’s good to have players on the opposite end of the emotional spectrum to balance things out. Also, Martin’s personality traits are more conducive to accepting a bench role, instead of wanting to be the man. Martin tried that for 9 seasons in Sacramento and Houston with mixed results. He had good stats (21.5 ppg from 2006-2012), but his teams were never good enough to make the playoffs. In an interview with Hoopsworld in late December, Martin stated, “…I’m so happy right now and being with these guys has given me an extra pep in my step. It’s just fun being here. It’s a great organization and great guys. I’m happy right now.” The burden of carrying a team can be pretty daunting, and statements like this lends to me think that Martin is happier being a contributing player on a successful team, than being the man on a mediocre team. Community-oriented – Martin is known as one of the most affable and approachable players in the league. He is heavily involved in the community in his hometown and even won the 2008 Oscar Robertson Triple Double Award, which is a community involvement award given out annually by the Sacramento Kings. If there’s one thing the Thunder organization places utmost importance on, it’s community involvement. Most players do community activities because the League relegates that they have to. But, Martin is one of those players that truly enjoys being involved in the community. On record – When Oklahoma City first got a team, one of the things that detractors hung their hats on was that players weren’t going to want to play or stay in OKC. That the players would skip town at the first opportunity, or never even consider OKC in free agency. In an interview with Marc Stein of Yahoo! Sports in late January, Martin put it on record, saying, “This summer, hopefully everything works out here. I haven’t said that too often. But I will put it out there; hopefully I have found a home in the NBA. I love playing with this group of guys. The organization is great to me. The community has been great to me. It’s the happiest I have been during my NBA career.” While many Thunder fans may take that statement with a grain of salt, after James Harden basically said the same thing in the offseason, there’s an air of wisdom and experience in Martin’s statement that makes it sound more believable. Production – The trade in late October sent one of the best bench units in the league into complete disarray. Gone from the team were Harden, who was the reigning 6th Man of the Year, Cole Aldrich, who was thought to be the team’s back-up center, and Daequan Cook, who was their situational 3-point shooter/floor spacer. In addition to that, the back-up point guard position was shaky at best, with Eric Maynor coming off of an ACL injury and Reggie Jackson still learning how to play point guard in the NBA. 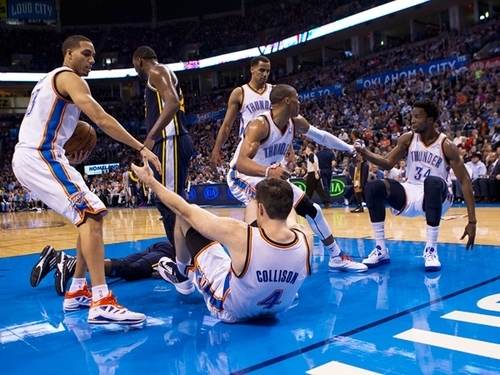 In essence, the Thunder got rid of 4 bench players for one bench player (Martin) and one project player (Jeremy Lamb). It’s taken a little bit more than half of the season, but the bench seems to have solidified itself into a stable outfit. Martin is one of the league leaders in bench scoring, averaging 14.5 points per game. He’s assumed the role of 3-point specialist (43%) and floor spacer when he’s on the floor with Durant and Westbrook, especially late in games. And he’s begun to develop a chemistry with Nick Collison that is akin to the chemistry Collison and Harden had together. Leverage – The player Martin was shipped with to Oklahoma City in the James Harden deal may ultimately be the reason Martin becomes expendable. Since the moment he donned a Tulsa 66ers jersey, rookie Jeremy Lamb has been lighting up the D-League to the tune of 21.1 points, 5.4 rebounds, 3.3 assists, and 1.1 steals per game in 16 games. While success in the D-League doesn’t always equate to success in the NBA, Lamb has flashed the tools to be a consistent scorer/shooter at the NBA level. Comparable players – These are four players (and their salaries) that are comparable to the role that Martin plays on the Thunder. All of these players are perimeter oriented bench scorers who are average to below average defenders playing for playoff teams. That’s a 21% drop off in scoring (and noticeable drops in every shooting percentage) outside of the friendly confines of Chesapeake Energy Arena. This may become a factor in the playoffs as the Thunder move forward. CBA and luxury tax – This may be the biggest hindrance in keeping the Thunder from resigning Martin. Starting next season, the Thunder will have $54.19 million allocated to 4 players (Durant, Westbrook, Serge Ibaka, and Kendrick Perkins). That leaves about $16 million in pre-luxury tax cap space for 11 roster spots. While the Thunder may have to eventually get into the luxury tax to stay competitive, they will try to stave it off for as long as possible. A lot still remains to be seen concerning Martin and the Thunder. While Martin has performed well in the regular season for his career, he’s never been overtly tested in the playoffs. The last time Martin was on a team that made the playoffs, his teammates included Ron Artest, Bonzi Wells, Shareef Abdul Rahim, Mike Bibby, and Corliss Williamson. While he performed well in that one playoff series, it still remains to be seen how Martin will perform as the team advances in the playoffs. Martin seems to be getting more acclimated with his role off the bench. He’s developed a 2-man game with Nick Collison that defenses have to respect. And his ability to space the floor has opened up driving lanes for back-up pg Reggie Jackson. Martin also seems to be getting more used to his role as a shooter/floor spacer late in games with Durant and Westbrook on the floor. When the Thunder acquired Martin before the season, I think they had every intention on keeping him and seeing how things played out throughout the season. Even though his $12.5 million expiring contract may have been a valuable commodity at the trading deadline, Martin’s name was never mentioned in any trade rumors leading up to the deadline. One of the reasons why the transition from Harden to Martin has been mostly seamless is because Martin provides a lot of the same production that Harden did. He’s an efficient shooter and a good scorer, who’s always looking to attack the defense. That’s a rare commodity to have when a team can rest its starters and still keep the defense on their heels with its second unit. 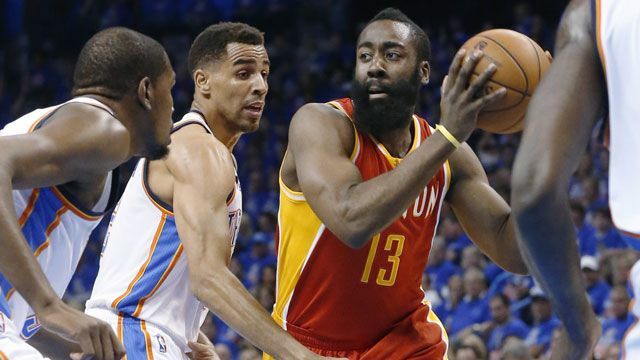 While the trade brought big changes to the roster, the Thunder never had to change any of their game planning because of the similarities in the styles of play of Harden and Martin. Martin, for his part, seems to be genuinely happy in Oklahoma City. 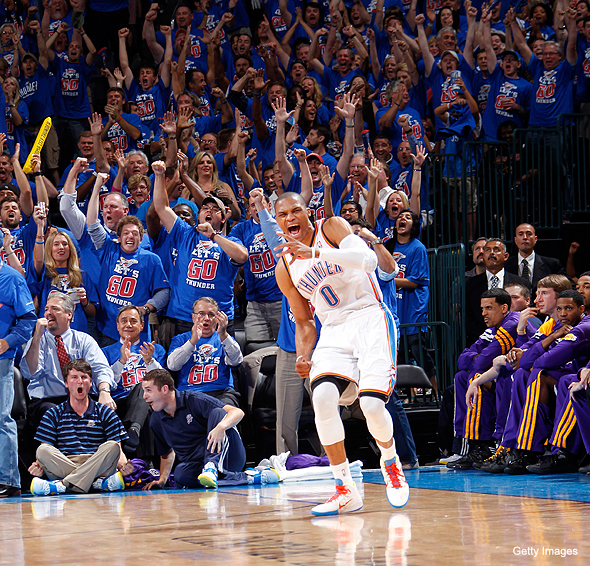 I think there are several reasons for his happiness that may work in the Thunder’s favor in resigning Martin. First off, the pressure of being “the man” on the team is no longer on Martin. While Martin is a good scorer, I don’t think he ever embraced being the No.1 guy on a team. Some players are meant to be alpha males, while others are meant to be great role players. Martin seems to fall in the second category. Secondly, he’s playing on a championship contending team. I don’t know how Martin feels about his legacy, but playing for championships tends to enhance your legacy as a player. Thirdly, Martin may actually increase his longevity in the role that he is currently playing. Martin has always been known to be injury prone, playing in over 60 games only 5 times in his 10 year career (to include this season). Coming off the bench on a championship contender, Martin is playing the least amount of minutes since his 2nd season. And he’s going to the FT line a lot less, meaning that he is not driving or putting his body in harm’s way. The most important factor in all of this is money. How much is Martin willing to sacrifice, and how much are the Thunder willing to offer? Every championship team has an elite bench scorer or a combination of capable bench scorers. I’m sure that even Martin knows he’s not worth the $12.5 million he’s currently getting paid. If the Thunder offer Martin anything comparable to what Jamal Crawford or Jason Terry are making, will he take that offer? Or will he jump at an offer from another team desperate for a shooting guard (Utah, Minnesota, Dallas) that will likely be substantially more than what the Thunder can offer? Another option for the Thunder is Jeremy Lamb. Is Oklahoma City willing to go into next season with Jeremy Lamb and Reggie Jackson as the main components of their bench unit? I think the Thunder see Martin as their firepower off the bench for the next few seasons. If they were willing to go into the luxury tax for Harden, you can be sure that they’ll keep Martin at a much lower price. My prediction is that Martin will sign a contract comparable to what Jason Terry got (possibly 3 years/ $16.5 million) in the offseason. Martin seems like a mature person that realistically knows his strengths and his weaknesses. He knows that this as a great opportunity to play on a team, and in situations, that matter. In the end, I think he’ll choose legacy and longevity over money. Home, sweet home. After suffering their first 3-game losing streak since last season’s Finals, the Thunder were looking to rebound with three straight home games. And rebound they have, winning the first two games of the home stand by an average of 23 points. While Kevin Durant continues to be mired in a slight slump, Russell Westbrook has stepped his game up to the tune of 25.1 points, 6.4 assists, 4 rebounds, and 2 steals per game in the month of February, while shooting 50.6% from the field and 45.8% from the 3-point line. Serge Ibaka has also been much more impactful in his play during the home stand which has provided the Thunder with some semblance of a post presence. The Thunder and New Orleans Hornets have met 3 times this season, with OKC coming out on top in the first two games by an average of 18 points. In the third meeting, the Thunder needed a late second half spark from then seldom used point guard Reggie Jackson to come back and win a close game, 92-88. Since that game, Jackson has solidified himself as the back-up point guard for the team, supplanting Eric Maynor. The New Orleans Hornets come into the game 20-38 record, good for 13th in the conference. The Hornets are in the midst of a rebuilding project following the Chris Paul/David West years. Statistically, they rank in the bottom half of the league in nearly every category. Offensively, they only score 94.5 points per game (22nd in the league), and defensively, they allow a respectable 97.3 points per game (13th in the league). They are paced by point guard Greivis Vasquez, who is averaging 13.7 points, 9.4 assists, and 4.6 rebounds per game. Shooting guard Eric Gordon, oft injured since being acquired from the Los Angeles Clippers last season, has come back in the past 20 games, and is averaging 16.7 points while working his way back from knee surgery. Although Al-Farouq Aminu is given a bad rap as having a low basketball IQ, he is the glue of the team, providing anything from points to boards to defense. Up front, the team depends on rookie Anthony Davis and center Robin Lopez who supply respectable post defense and rebounding. Off the bench, the Hornets are led by stretch power forward Ryan Anderson, one of the premier 3-point shooters in the league. The rest of the bench is inconsistent with rookies Austin Rivers and Brian Roberts being one of the focuses of the rebuilding project. 1. Tempo – With this being the 2nd game of a back to back for the Hornets, the Thunder need to push the pace, and get out in transition whenever possible. It’s very surprising that the Hornets, while being a very young team, do not push the tempo. They are very similar to the Memphis Grizzlies in that respect. Also, the 2nd team for the Thunder will be chopping at the bit with new additions Ronnie Brewer and Derek Fisher ready to play in their first game of the season for the Thunder. 2. Perimeter defense – With Eric Gordon and Ryan Anderson on the floor, the Hornets have guys that can catch fire quickly from the perimeter. While Lopez and Davis are of some threat to score down low, the Thunder defense does not need to sink in on most possessions to help out. 3. 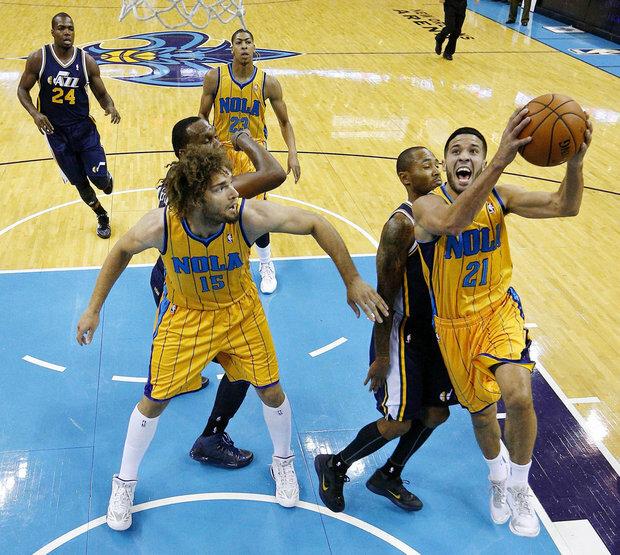 Kevin Martin – For some reason, Martin loves playing against the Hornets. He averages 21 points, 4.3 rebounds, and 2 assists per game against the Hornets, by far, his best statistical team split of the season. This game brings to it a sense of deja vu. The last time the Oklahoma City Thunder played the Miami Heat, the Thunder were coming off a loss. The Thunder ended up losing that game to the Heat on Christmas day for their only consecutive game losing streak of the season. This time the Thunder are coming off a loss to the Utah Jazz, and would love nothing more than to get a victory against last season’s Finals opponent before heading into the All-Star break. Remember, Kevin Durant and Russell Westbrook has to swallow the bitter pill of playing with Lebron James in the Olympics after their NBA Finals loss. The last thing they want is to lose to Lebron and the Heat again, when they’ll probably have to link up for NBA-related activities during the All-Star break. 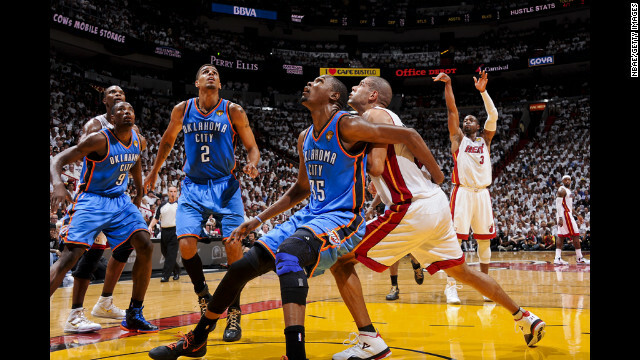 In their last meeting, the Thunder and Heat played in a game that met expectation. While the Heat held the lead for most of the 4th quarter, the game was tight with Durant and Westbrook both having chances to tie the game in the closing seconds. The main characters performed well, with Durant and Westbrook leading the Thunder with 33 and 21 points, respectively, and James and Dwayne Wade leading the Heat with 29 and 21 points, respectively. The main difference were the role players, where Kevin Martin and Serge Ibaka each had 15 points for the Thunder, while Chris Bosh and Mario Chalmers had 21 and 20, respectively, for the Heat. 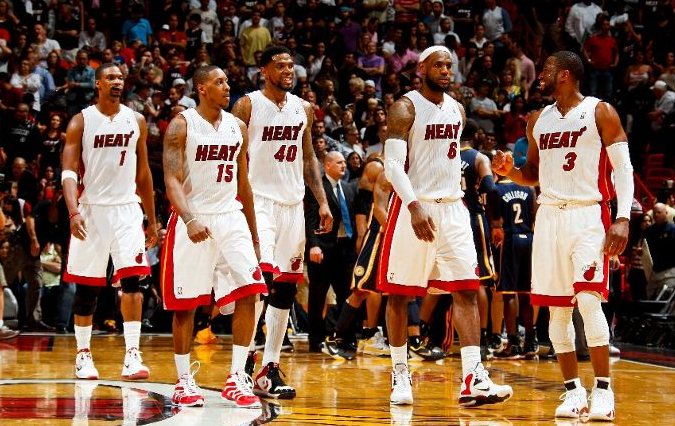 The Miami Heat come into the game with a 35-14 record, good for 1st in the Eastern Conference. They are currently riding a 6-game winning streak. Their offense is top-5 in the league (103.1 ppg, 5th in the league) and their scoring defense is in the top half of the league (96.7 ppg allowed, 12th in the league). The Heat are led by all-world forward Lebron James, who is having one of the best seasons the league has ever seen. He is leading the Heat in 4 statistical categories (scoring, rebounds, assists, and steals), while leading the NBA in Player Efficiency Rating (PER). The backcourt consists of Mario Chalmers and All-Star Dwayne Wade, who is also having a great season, averaging 21 points, nearly 5 rebound, and nearly 5 assists per game. The front court consists of rugged PF Udonis Haslem and All-Star Chris Bosh. The bench is full of 3-point shooters (Ray Allen, Shane Battier, Norris Cole, Mike Miller) and the recently signed Chris Andersen. Perimeter Defense – Its the rock and the hard place that defenses face when they play the Miami Heat. Do you allow James and Wade to penetrate into the lane, but stay home on the shooters? Or do you collapse the defense to protect the paint, while exposing yourself on the perimeter? The Thunder always seem to get burned a one of the Heat’s role players (Battier in the Finals, Miller in Game 5, Chalmers in the Christmas game) on the perimeter. Rebounding – The Heat are last in the league in rebounding at 38.7 rebounds per game, which is completely unheard of for a championship contender. The Thunder bigs need to control the paint and not allow the Heat to get extra opportunities on offense. Kevin Durant needs to slide down and help out on the glass, especially when he is playing the 4, which I feel will be often in this game. 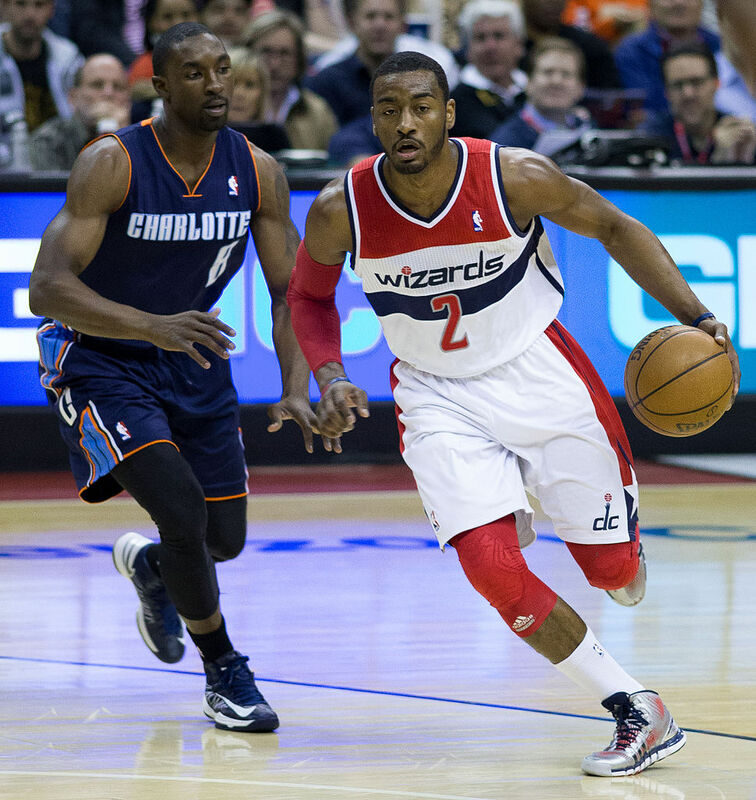 Scott Brooks and match-ups – This is probably one of the biggest subplots in the game. The Heat don’t play a tradition center (big, always in the paint, post presence). This negates the effectiveness of Kendrick Perkins, but Brooks always seems to have Perkins out on the floor when the Heat are playing small (usually in the 4th quarter). Will Brooks switch it up this time, or will he stay with the same defensive line-up when the Heat go small? Also, who guards Lebron James? Do you put KD on Lebron and risk Durant being in foul trouble? 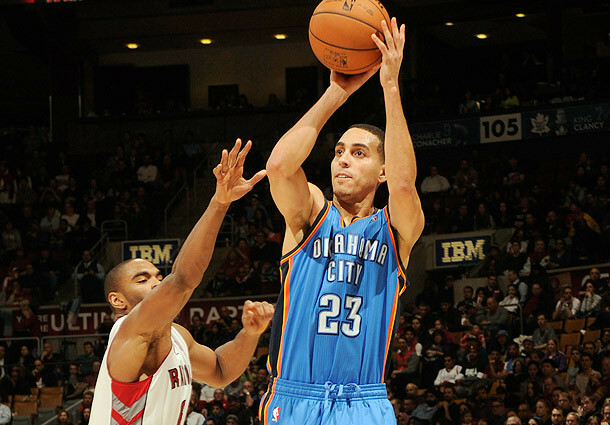 Or do you go with Sefolosha or Liggins? Whatever the decision is, it will probably a case of picking your poison.